A. Stomakhin, R. Howes, C. Schroeder, J. Teran. Energetically Consistent Invertible Elasticity. Eurographics Symposium on Computer Animation (SCA) 2012. 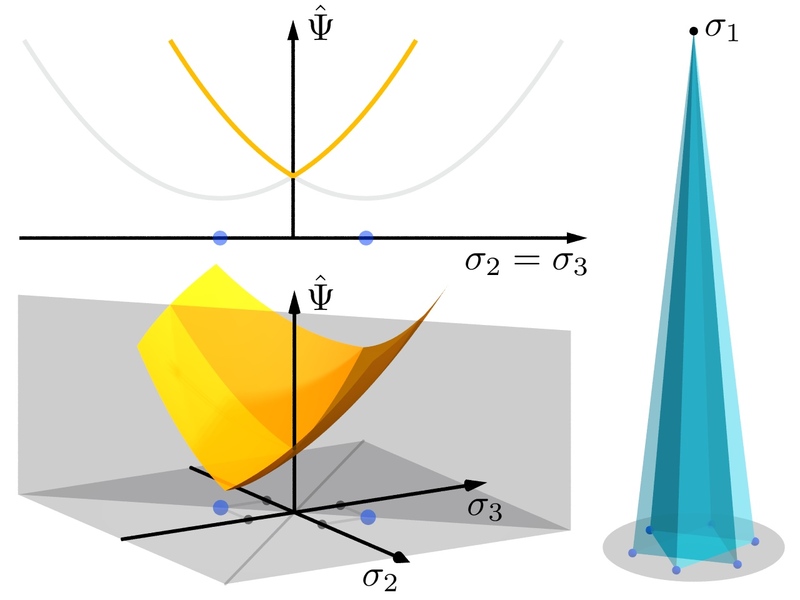 We provide a smooth extension of arbitrary isotropic hyperelastic energy density functions to inverted configurations. This extension is designed to improve robustness for elasticity simulations with extremely large deformations. We show that our energy-based approach is significantly more robust to large deformations than previous approaches. Furthermore, we show that the robustness and stability of a hyperelastic model can be predicted from a characteristic contour, which we call its primary contour. The extension to inverted configurations is defined via extrapolation from a convex threshold surface that lies in the uninverted portion of the principal stretches space. The extended hyperelastic energy density yields continuous stress and unambiguous stress derivatives in all inverted configurations. We show that our invertible energy-density-based approach outperforms the popular hyperelastic corotated model, and we also show how to use the primary contour methodology to improve the robustness of this model to large deformations.